With a fascinating past, gorgeous architecture, good food, scenery, friendly people and lots to see and do, Budapest is a great city break destination. Start here with my basic Budapest travel tips, or jump down below to read my latest Budapest travel blogs. Like many central European cities, Budapest has mild springs, hot summers, colourful falls and bitterly cold winters. To experience the life outdoors that Budapest has to offer, summer is no doubt the best time to visit, but regardless of when you visit, you’ll find cool things to do all year round. Go to a thermal bath – One of the most popular things to do in Budapest is soak in one of the many grand thermal baths. Széchenyi, Géllert and Lukacs are the best known and perhaps most beautiful ones in the city, with Széchenyi being the perfect choice for summer months because of its large outdoor space. Visit a ruin bar – Hosted in old, ruined buildings, these bars that are to be found all around Budapest are grungy and dilapidated but that is all part of the charm! Top ones include Szimpla Kert, Red Ruin and Forgasház. Climb Buda hill – For spectacular views over the city, climb the steps up Buda hill on the west side of the Danube river. There’s also a funicular railway that you can take up to the top if you don’t feel like the climb, but either way, it may be the best view of the city down the length of the river and across to the famous and intricate parliament building. Try the Hungarian food – Don’t miss out on classic Hungarian cuisine like langos (yummy!) and, of course, goulash. Look for authentic Hungarian restaurants, bars, cafés and even the odd food market (try Szimpla’s weekend food market). Although it’s a relatively small city, taking a tour around Budapest will save you time and get you in to some areas of the city you might otherwise overlook, so it’s definitely worth you time to consider one. Take a look at this selection of Budapest tours. 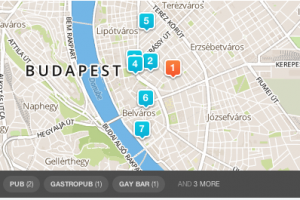 These are a few of the best things you should know about visiting gay Budapest. Alterego – This stylish but fun gay club is one of the city’s best established. They have themed nights, karaoke evenings and regularly put on excellent drag shows. Good bet for a fun night out! Magnum Sauna – Offering professional massages, and of course all the other facilities you’d expect in a gay sauna, this place is clean and comfortable and even offers an unlimited weekend pass that lets you come in and out as many times as you like from Friday to Sunday. Coxx Club – With a bar at the front and an extensive labyrinth out back, this cruising club for men is clean and well taken care of. The crowd is mostly younger guys and tourists. Budapest has plenty of cool and quirky hotels, as well as all the big chains you’d expect. They’ll likely get full when there’s a conference or special event in town, so definitely consider booking in advance. I’ve found that using Booking.com, Agoda.com or Hotels Combined can be really useful for finding last-minute deals.